Estimated reading time: 3.7 mins. 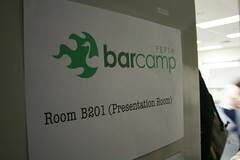 Yesterday was BarCamp time here in Perth. It brought together not only the usual web industry technical people but also those from the education, interactive media, librarians and students. This was good melting pot of people within related industries which allowed for a full program at the end of the day. Didn’t get to some of the talks in the morning which is a shame, I missed Scott Barnes‘ Silverlight presentation as we planned for our Web Business Panel. Also missed the Explaining Web 2.0 to “noobs” session, mainly due to the room not being conducive to people sneaking into the room late. Interesting point we had a 50% female/male speaker ratio, mainly I feel due to the promotion of the event in areas outside of the technical end of the Web Industry. This was Steven Hambleton first presentation, very ad-hoc, but with a little crowd prompting Steve presented a nice overview of Expression Engine. It was good to see this medium level CMS getting a little bit of promotion over the usual Open Source offerings. When I was debating what to do for BarCamp a few weeks back I decided on taking about the extreme edge of customising the WordPress Loop and maybe putting some example together with some mashup goodness. But the evening before BarCamp I decided to cut the technical content. Hopefully people didn’t find it too boring and lame. It appeared to go over well. Even if I did make a few presentation errors (again!). But people if you think it sucked please tell me. Matt Didcoe and Myles Eftos presented an Introduction to Ruby on Rails. This was just what I was looking for Myles and Matt where frank and honest with the strong and week points of Ruby. It was a refreshing presentation on the RoR topic. It did however make me bump RoR up the to do list; yeah I have been slack sleeping and not using that time to learn all about RoR. Yeap time to step up for part two of the Starting a Web Business. Frankly we did a average job on this, but it wasn’t as topic focused as it could have been. Mind you this could have been a whole day workshop. One downside doing three presentations in the day was a little over the top. It does drag you away from the presentations you want to see, like the Geek Ergonomics by Kay Smoljak. Bronwen Clune and Richard Giles led a round-table discussion on “Does Perth have what it takes for Web 2.0“. This was a very educated and frank discussion, which a great deal of in-depth material being put on the table. This session was very passionate, and as expected went overtime. A lot of good ideas did come out of this session. In someways it would have been good as a morning workshop. Apology to Kathryn, I missed the Second Life presentation. I do reget this, but I’m really hopeless with timetables and schedules at these type of events. It was really good to get F2F with a number of people such as Sue Waters from TAFE and Kate Raynes-Goldie (PHD Student at Curtin University) , Tiang Cheng, Kate Quin and Constance Wiebrands. A lot of people worked tirelessly at the BarCamp, none more so than Myles Eftos. Other such as Simone Van Hattem and Pascal Wijnberg looking after the food, Chris Quinn for the photos and Drew Robinson and Stuart Greenhill for the video really need to be thanked (Ed: thanks Simone for the update). Then there is Jordon Brock; single handy Jordon tamed the beans from the gods and produced the most amazing coffee for all, hats off to you Jordan. Sure somethings could be improved, but that’s what life is all about, learning and changing. As expected it went on well into the evening thanks to Microsoft and Scott Barnes. Reports are a really good time was had by all at the post BarCamp dinner. People are already discussing the next BarCampPerth. If you didn’t come along you missed a really good day. Don’t forget it was free. Lots of geeky shared information, no pressure, just a friendly and relaxed atmosphere.